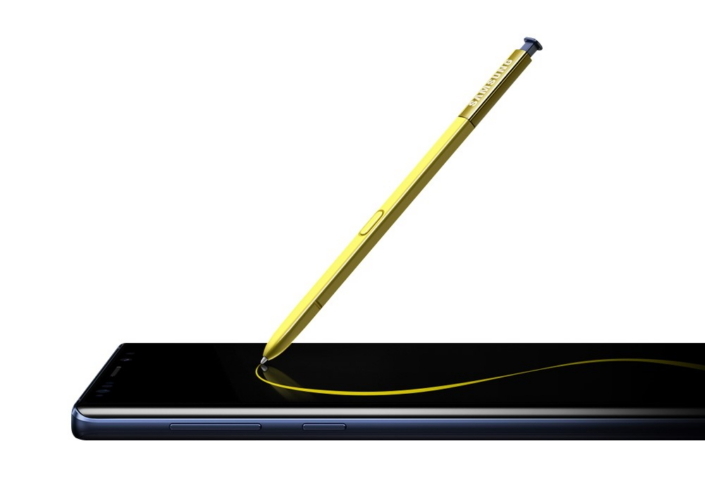 Each new addition to the Note family introduces exciting capabilities to the smartphones’ signature feature: the S Pen. Over the years, these refinements have unlocked innovative ways for users to communicate with others and streamline work, play and everything in between. 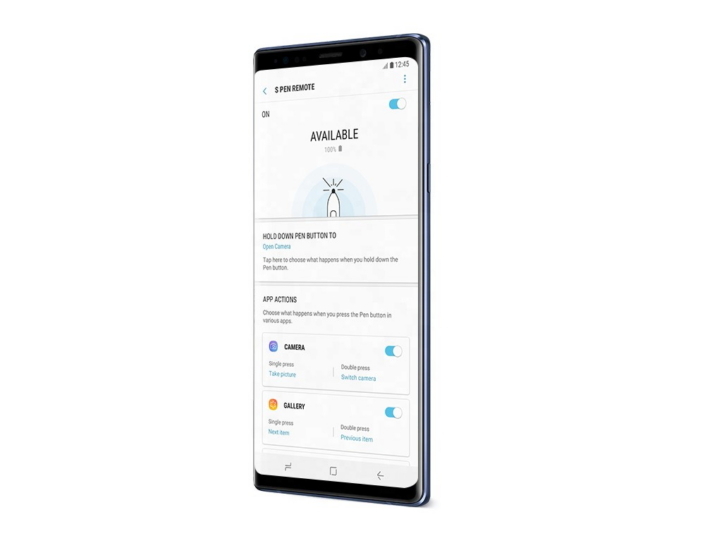 The Galaxy Note9’s S Pen raises the bar with an array of convenient additions, including Bluetooth Low-Energy (BLE) connectivity, Samsung DeX compatibility, and integration with several fan-favorite Note features. Together, these enhancements offer much greater control over your mobile experience, making it easier to get the most out of everything you do. The S Pen has always been a boundary-pushing innovation, but adding BLE connectivity takes it to another level, literally expanding the boundaries within which you can use your S Pen to manage your device. The S Pen’s connectivity allows it to serve as an intuitive remote control for your Galaxy Note9 that lets you easily manage key functions, including the device’s camera, from within 10 meters of the device. 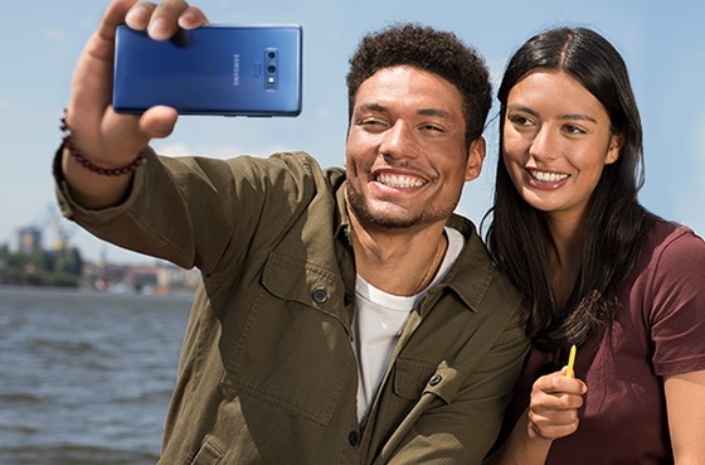 This means that when taking a selfie or a fun photo with friends, after launching the camera, rather than reaching for the shutter button (and possibly jeopardizing your carefully framed shot), you can instantly snap your pic with a click of the S Pen’s button. A double-click will switch from the front to the rear camera, and vice versa. Other apps that support the use of the S Pen as a remote control include the Gallery app and various presentation and media-player apps1. A simple click or double-click will allow you to play/pause a song, skip to the next track or video, or view the next/previous image in an album. You can even utilize the S Pen as a convenient clicker for presenting with the Galaxy Note9 and Samsung DeX. And with its open SDK (software development kit), developers will be able to integrate the S Pen’s intuitive controls into a wide range of apps that will allow you to streamline more tasks with a simple click. The S Pen also allows you to easily launch a favorite app or feature with a long press, regardless of the currently opened app. You can also customize clicks in the S Pen’s settings2. BLE technology ensures that the S Pen is always ready whenever you need it, enabling the device to pair with the Galaxy Note9 as soon as it’s removed, and maintaining a stable connection even when Bluetooth is turned off. The S Pen’s Super Capacitor takes just 40 seconds to reach full charge, and offers 30 minutes of power—or up to 200 clicks. Note users are true multitaskers who require a phone that’s as versatile as they are. That’s why Samsung enhanced the Galaxy Note9’s S Pen with Samsung DeX support: to offer users more ways to get down to work. Samsung’s ultimate productivity service solution has been enhanced for the Galaxy Note9 with highly portable HDMI adapters, which users can easily plug in to a display when on the go without the need for a separate device. In addition, there’s also the dual screen support that allows you to work simultaneously on the smartphone’s display and on a connected monitor. 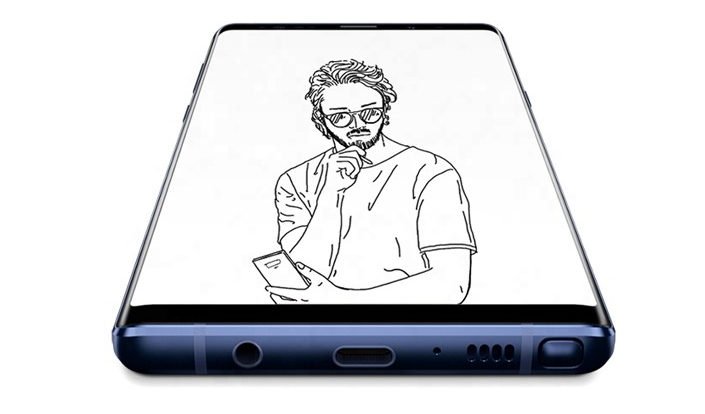 Connecting the Galaxy Note9 to a monitor will also allow you to utilize the device as a touch keyboard, a touch pad, or a surface for writing or drawing with the S Pen. 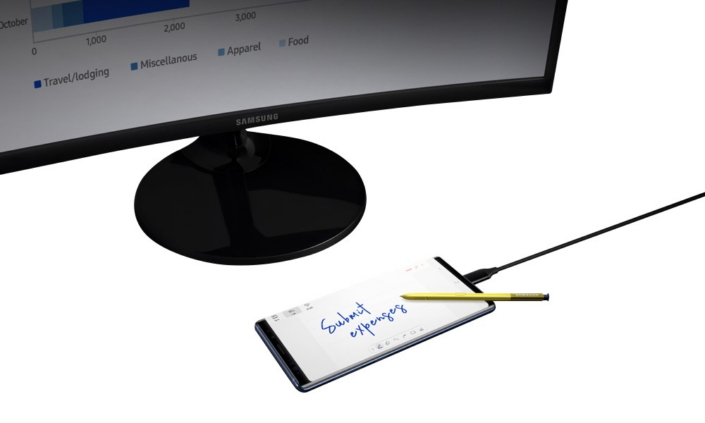 The S Pen’s pressure-sensitive tip delivers a realistic and efficient writing experience when working on Samsung DeX, making it easy to, for instance, take notes on an interesting video that you’re watching on the monitor, or fine tune an image or illustration using your Galaxy Note9 and the Adobe software suite. Last year’s Galaxy Note8 introduced Live Message, a particularly fun feature that allows you to inject more emotion into messages by drawing your own emojis, making animated GIFs, and customizing photos with pen effects and handwritten notes. The Galaxy Note9 expands Live Message’s expressive capabilities by integrating support for Samsung’s ever-emotive, user-resembling AR Emoji stickers. The S Pen adds new layers of fun to sharing AR Emoji stickers by allowing you to customize them with personalized messages, drawings and more effects, which may be shared via messaging apps. And the fun doesn’t stop there, thanks to the new PENUP-powered Photo Drawing and Live Drawing features. The former adds a creative twist to the Gallery app, allowing you to draw over your own pics to create impressive works of art, while the latter offers video tutorials to help you fine-tune your artistic skills. Screen off memo has also been made more dynamic, as the color of the pen’s markings now matches the color of the S pen itself—either yellow (for the Ocean Blue Galaxy Note9), light grey (for the Midnight Black model), lavender purple or metallic copper. The Galaxy Note9’s S Pen is comfortable in the hand, measuring 106 millimeters in length and weighing in at 3.1 grams. Its 0.7-millimeter tip and 4,096 levels of pressure sensitivity provide impeccable precision, adding comfort and accuracy to note taking and drawing. Like the Galaxy Note9 itself, the S Pen is IP68 water and dust resistant3. So wherever your day takes you, and no matter conditions, you can rest assured that it’ll be ready to work. S Pen Remote SDK for third-party app developers to adapt the Note9 S Pen's capabilities for different applications is here if anyone out there is interested. Samsung should reach out and work with its partner Google to get this feature available on Google Apps, including for example Youtube. Also third-parties applications developers should get into it! That's not what we like to hear, @Samson4. ? We're sure the wait will be worth it. Let us know how you get on.